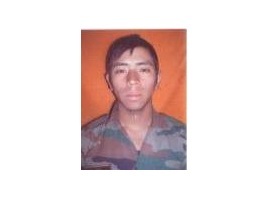 Mortal remains of Rifleman Sunil Rai, who was buried under snow after an avalanche struck an army patrol on 25 March 2016 in the Turtuk Sector was recovered by rescue teams today morning. Lance Havildar Bhawan Tamang who was retrieved immediately after the avalanche had succumbed to his injuries yesterday. The mortal remains of the soldiers are being evacuated from the area of the avalanche, after which, a wreath laying ceremony will be conducted to honour the martyrs. Thereafter, they will be transported by air to their native places where they will be accorded funerals with full military honours. Lance Havaldar Bhawan Tamang is survived by his wife, a six year old daughter and his parents, whereas Rifleman Sunil Rai is survived by his parents and two younger brothers.